It’s finally done! I put the last stitch in the binding this afternoon. 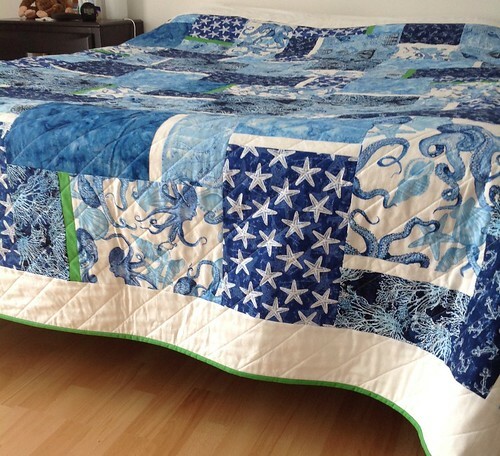 The pattern is Big & Bold by Cozy Quilt Designs, and the fabrics are mostly from the Deep Sea collection by Timeless Treasures. I made the queen size, substituting a wide solid border for the two narrower ones in the pattern. It’s been a fun project because 1) it’s for my husband, 2) I love the colors, and 3) it’s different from what I usually sew. That said, it will be a long time before I do another quilt this size again. This one is 95″ x 95″ and let me tell you, quilting it was epic. Seriously, E.P.I.C.! 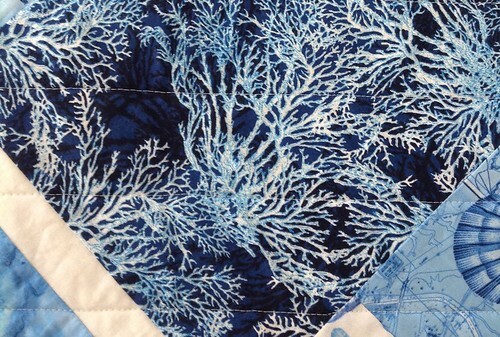 And I only quilted straight lines on the diagonal, 2″ apart. Still, with half or more of the quilt rolled up and supported by my left shoulder, I had a heck of a time maneuvering the whole thing through the sewing machine. Yes, my regular sewing machine. If you’re thinking right now that I must be crazy, let me assure you, I thought that too several times during the quilting process. It did get a little easier once I figured out the logistics of it. After that, it was sheer determination, hehe. There are more than a few areas with crooked or wavy stitching. I was going to fix them but my husband said not to worry, that he didn’t even notice. And really, who else is going to be close enough to his bed to examine the stitching on the quilt? I let it be. I am seriously proud of the binding. First I had to look up in a quilting book how to do those corners when I sewed it on, but now I know. And I love how they turned out. It’s quite a bit of hand-stitching to go around the whole quilt and it took almost the whole last week, sewing maybe an hour or so every day. It’s such peaceful work, too. Very enjoyable. It totally made up for the epic undertaking that was the quilting. So, now that that’s done, maybe I can start working on some clothes.